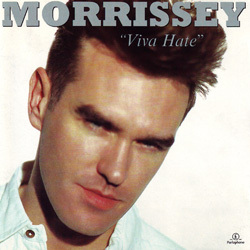 In 1997, for the 100th anniversary of EMI, Viva Hate was reissued along with 99 other classic EMI albums. This new edition was produced with new artwork and was augmented with 8 bonus tracks. The cd was slipped into a cardboard box with a thick EMI booklet. In January 1998 (and later in 2002), the album was reissued again, this time without the box and booklet, but with same catalogue number. The version without the box was also released in Mexico and Korea. View information about the 2012 reissue here. A photo taken by Eamonn McCabe was used for this 1997 EMI Centenary edition of "Viva Hate". 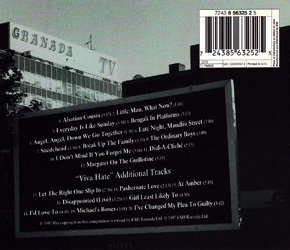 The Granada TV photo seen on the back (taken by Linder Sterling) was cropped and modified from an original photo (found inside the booklet) of Morrissey grinning in front of a billboard advertising his live album "Beethoven Was Deaf". UK: Stock copies with a promo sticker, occasionally paired with a press release, were distributed for promotion of this re-release. This also happened when the album was re-printed in 2002. A EMI various artists radio promo cd sent to radio at the time of the original re-release (1997) included "Suedehead", "Everyday Is Like Sunday" and "I've Changed My Plea To Guilty". A different Virgin cd sampler sent to radio at the time of the 2002 reprint included snippets of "Suedehead" and "Everyday Is Like Sunday".